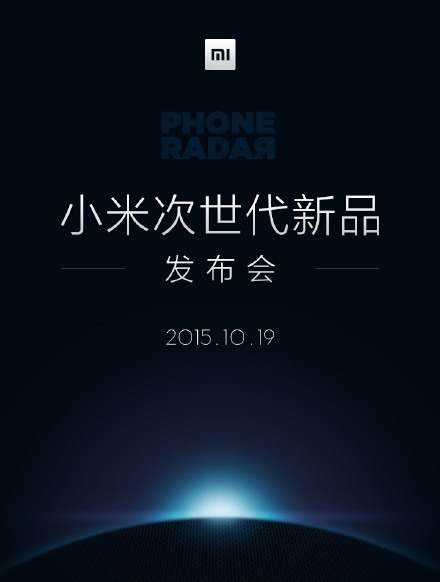 Xiaomi Mi5 sporting Helio X20 processor is now ready to be unveiled at the October 19th event in China. The company had sent out the press event saying ‘Next generation of New Conference.’ We can also expect the company to launch the rumored Mi Band 2. Earlier to this, everyone expected to launch the Mi5 with Snapdragon 820 quad-core processor, but the production of the Snapdragon 820 is getting late the company want to launch the device with Helio X20. Helio X20 is the upcoming processor from MediaTek that includes ten cores. This is the successor of the Helio X10 processor that was earlier seen in the HTC One M9+, Meizu MX5, Xiaomi Redmi Note 2, and many more. Apart from the Helio X20, the Mi5 sports 5.2-inch Quad HD (1440×2560) AMOLED display, 4GB RAM and 16/64GB of Internal storage. It also sports a 16MP rear camera with dual LED flash, 8MP front camera and a battery of 3,030mAh capacity. The device also includes a fingerprint sensor for making the device more secure. The Snapdragon 820 variant of Mi5 will also be announced but will be available in the market only in early 2016. The expected pricing for the Mi5 powered by Helio X20 is around 1,999 Yuan ($316). We can also hear some news about the Windows 10 powered tablets and laptops from Xiaomi. According to the leaks, the tablet will be launched before the end of this year and the laptop will be launched before the first half of 2016. Stay tuned for more information.